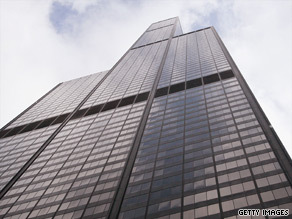 Landmark opened in 1973 with original tenant Sears Roebuck & Co.
CHICAGO, Illinois (CNN) -- Sears Tower is history. As of Thursday, the iconic Chicago, Illinois, skyscraper is now named Willis Tower. It still looks the same, but Sears Tower in Chicago, Illinois, will have a new name: Willis Tower. At least that's what the owners of the 110-story skyscraper now call it after its new main tenant, the London, England-based insurance broker Willis Group Holdings. However, there are plenty of people who refuse to call it that. More than 90,000 people have joined the group "People Against the Sears Tower Name Change," on the social networking Web site Facebook. "This name change is absurd," one member wrote. "Would Paris change the name of the Eiffel Tower? Or London change Buckingham Palace? Or New York, the Statue of Liberty? I believe the Illinois Congress needs to proclaim the Sears Tower a recognizable landmark that is known all over the world by people who have traveled to Chicago." The group has gathered more than 34,000 signatures on an online petition against the name change. The name change seemed to be a fait accompli, though. "Having our name associated with Chicago's most iconic structure underscores our commitment to this great city, and recognizes Chicago's importance as a major financial hub and international business center," Willis CEO and Chairman Joseph J. Plumeri said in a news release. The landmark opened in 1973 with its original occupant, Sears Roebuck & Co. The retailing giant has since moved its headquarters to suburban Chicago. That doesn't matter to those against the name change. "I asked a cabdriver to take me to the Willis tower. He said, 'Where the hell is that?'" a member of the Facebook group wrote. "That pretty much sums it up. No one will start calling it the Willis Tower."